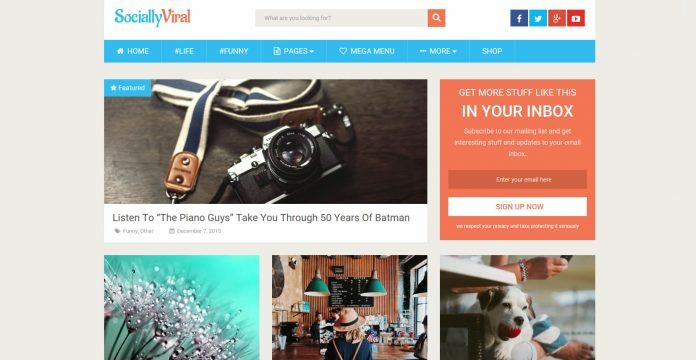 SociallyViral is a beautifully designed blog WordPress theme by MyThemeShop that is optimized for engaging audiences, fast loading, boosting viral traffic and increase CTR rates via flexible ads placements. Design is focused on delivering content with prominent posts featured in a grid layout on the home page. Social icons are placed prominently on header area, above posts and below posts for maximum visibility. The theme comes with 2 different homepage layouts that are equally efficient in posts display. SociallyViral supports the video post type as well as the standard post type. And with a built-in Review system, you can write a customized review about anything! Additional features like built-in subscription box, allows you to deliver content to your audience via FeedBurner, an email service that allows publishers to deliver their feed content to subscribers via email. However, it does not seem to support other email service integrations. Other useful features such as the author box, related posts box, and popular posts box can be placed within a post or page sidebar to suggest to your readers of new, trending or related content, which in turn reduces page bounce rates. To customize the theme you can change the color scheme, typography and even add an unlimited amount of sidebars and compose the layout of your posts page with widgets. You can also assign different menu for different pages. Additionally, SociallyViral supports RTL languages and should you need the site to be in another language, you can configure to translate the terms used by the theme via the options panel. To increase revenue, you can manage your advertisements via the ad management options. And it is WooCommerce ready should you need to integrate a shopping element to your website to sell products. SociallyViral is designed to be similar to ViralNova.com, a very poplular viral content website. You can read about it on MyThemeShop blog post.